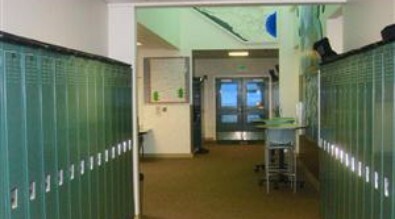 The Haines Middle School, including 7th and 8th grade, has an enrollment of about 45 students housed in the middle school pod. The student population, of which approximately 20% is Alaska Native and another 15% transient, is divided into class by grade. In addition to the middle school teachers, there are certified staff members in special education, physical education, vocal and instrumental music, art, counseling, and computers. Other programs operated through grants include Title I, Migrant Education, Indian Education and Johnson O'Malley. The teacher workday is from 8 am to 4 pm. Teachers use a variety of multimedia to present lessons to classes. Every classroom is equipped with a LCD projector, document camera, smart board, and a laptop cart for interactive learning. In 2012, the Haines Elementary and Middle School was designated as Title 1 Distinguished Schools. These schools demonstrate a wide array of strengths, including team approaches to teaching and learning, focused professional development opportunities for staff, individualized programs for student success and strong partnerships between the school, parents and the community. What makes National Title I Distinguished Schools' stories especially powerful are the documented student achievement gains that have resulted from their innovations. Art in the Middle School Hallway.